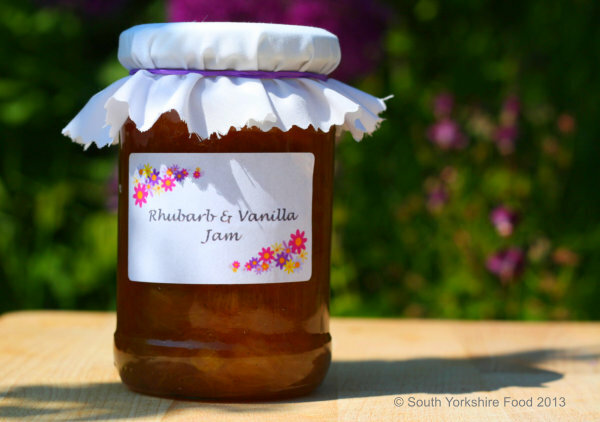 This is another scrumptious jam made with Yorkshire Rhubarb, created by guest chef Brenda Clough. The rhubarb came from the garden of Cortworth House, Wentworth. The vanilla lifts the flavour of the rhubarb to another dimension! This should make about three, 400g jars. 700g rhubarb, washed and diced. Note: don't peel the jrhubarb as it is the red colouring in the skin that gives the jam the lovely pink colour. Put a clean saucer into the freezer to chill. Put the rhubarb in a large saucepan and pour the sugar over the rhubarb and leave for one hour. Add the vanilla pod and the orange and lemon juice. Bring slowly to a boil over a medium heat, and boil for about 15 minutes. If not cook for another 5 minutes and test for the set again. Keep doing this until the jam has set to your satisfaction. When the set is right, pour into sterilised jars and seal.